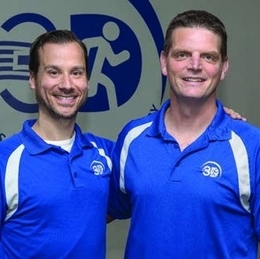 WHEN KEN GUZZARDO AN D JEFF SALLADE OPEN ED 3 DIMEN SION AL PHYSICAL THERAPY (3DPT) SEVEN YEARS AGO, THEIR GOAL WAS TO CREATE A HEALTH CAR E PRACTICE THAT FOCU SED ON BEING OUTSTANDING IN THREE AREAS: quality of treatment, superior customer service and having a deep-rooted involvement in the community. 3DPT still believes in those three important concepts and attributes their success to carefully hiring em ploy ees who will carry them out. This allows 3DPT to positively impact many of the people they are fortunate enough to come in contact w ith—below is an example of on e student-athlete who recently came to 3DPT and had a great experience. Samantha MacDonald started her jour ney at 3DPT in the fall of 2017 when she was recovering from a stress reaction in her back. For months and months, the 3DPT team helped MacDonald get ready for her spring lacrosse season at Shawnee. Unfortunately, during preseason, she fractured her left pelvic bone— leav ing her out for the entire season. After rehabbing for nearly six months, MacDonald has made a full recovery and is back to playing lac rosse. Many people—women more frequently than men—experience incontinence while exercising or following a pregnancy. Most people just accept it as a part of life and avoid finding a solution. “3DPT is unique as we have a pelvic floor specialist who can provide that solution and save y ou from embarrassing moments in t he gy m,” Sallade says. There has been more and more awareness regarding concussions over the past few years, especially as it relates to sports. Most peopl e don’t know that physical therapy can help speed up the recovery from concussions w hen they linger longer than expected. You don’t have to sit back and wait for it to get better—treatment for concussions and the symptoms that come along with it is available at 3DPT. People in the 65-and-older age group usually don’t jump right back up after a fall—there is usually some injury that occurs, common ly a fracture of some sort. This sets off a chain of events that is hard to recover from. Falls can be prevented by undergoing intensive balance training in physical therapy. Anyone over age 65 who has suffered a fall should be in 3DPT for balance training.